The Badshahi Mosque is a Mughal era mosque in Lahore, capital of the Pakistani province of Punjab. The mosque is widely considered to be one of Lahore's most iconic landmarks. Badshahi Mosque was commissioned by Emperor Aurangzeb in 1671, with construction of the mosque lasting for two years until 1673. The mosque is an important example of Mughal architecture, with an exterior that is decorated with carved red sandstone with marble inlay. Upon completion, it became world's largest mosque and remained so for 313 years until the expansion of Prophet's Mosque. 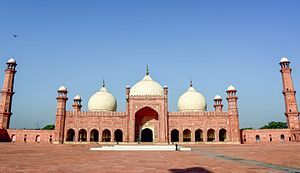 This article uses material from the Wikipedia article "Badshahi Mosque", which is released under the Creative Commons Attribution-Share-Alike 3.0 License.